Great stay, room spacious, very relaxing, nice pool. Staff friendly and very accommodating. Breakfast very good and fantastic views. There are LOTS of stairs to the rooms, not a problem for us but could be a problem for someone with mobility issues. Wonderful heritage hotel set amongst tropical gardens on the steep sides of the Tjampuhan River. Spacious individual bungalows each with own balcony, stunning Balinese architecture in dining and lounge areas with unique spa setting on river bank. Super friendly and helpful staff with excellent dining options, everything spotlessly clean. One warning: If you have any mobility issues (hip or knee) or very young children, this property is not suitable as it requires constant walking up and down steps right throughout the property. For everyone else though, highly recommended! Tjampuhan is an amazing hotel beautiful grounds an lovely staff. Not for people who don't like stairs. great food at the hotel an close by. fantastic coffee shop just across the road. this was my 5th stay at Tjampuhan and i will be back again..
My friend and I stayed here for four nights in March. Immediately, the staff were so welcoming. When needed, they were very prompt. However, at times they were possibly too friendly and stayed to long in room to chat. This hotel was just over 1km from the Ubud Palace and the art market. The hotel is about 600m from supermarket bintang, has good restaurants close by, and a minimart over the road. If you can't walk the distance, a shuttle runs from the hotel to the centre of ubud approx 4 times per day. We did not eat at the restaurant but prices look reasonable. Ignore previous comments about poor western food - what do you expect when you ask a balinese person to cook a non-balinese dish? You're in bali, eat some Gado Gado. On one occasion we could not access the wifi in the morning but was working by the time we returned to the hotel that afternoon. It was annoying to have to resubmit log in details when returning, however, if saved to your phone, makes it a smooth process. The speed was fine! At the end of the day, you are on holiday and you may need some wifi to look up reviews and maps etc, but it's not the end of the world. Be aware there are plenty of steps (at time steep and narrow) throughout the hotel so if you have problems managing steps, this might not be ideal for you. Our room was Bukit 2, directly next to the main road which was quite noisy during sleeping hours! I'm sure any of the other rooms would have been fine. During our stay, the main poor was being refurnished which was disappointing, however we were just unlucky with our timing. This place is well worth the visit! a nature lovers delight. If you love greenery ...its a must! What a setting! we were in awe of the setting as soon as we walked through the front door, an attractive, open display of the surrounding Jungle/Forest was instantly relaxing. the staff were always friendly and very accommodating to any and every request or enquiry we had, faultless. The grounds are well maintained and spotless. The pools were lovely and quiet and the Spa was one of the most interesting and artist endeavours I've come across. The 'deluxe' room is in a divine location and waking up to the forest on our doorstep was lovely. The room was all we needed and comfortable. The pillows were the only downfall of the Hotel, however easily forgiven with the excellence of everything else. I will absolutely be back for more! Thank you to all the wonderfully kind staff. This Resort is just amazing. It is very traditional nestled in a rainforest setting. It has a very peaceful feeling. The staff are friendly and nothing was a problem. The Spa area is a cave carved in the rock...looks amazing. The breakfast included was fabulous. The road to Ubud gets very busy..so a quick 10min walk will get you to restaurants and massages ????. The traditional carved stone and timber public buildings and leafy outlook of the hotel are beautiful however once inside our room we were disappointed to find the interior to by old and under maintained. Bathroom was old and unclean ( mould on walls in shower, water ran cold in shower and door handle was broken). Phone also didn't work. Also disappointed to find out upon arrival that the signature traditional rock carved spring water pools were an additional cost for in house guests. Location was good, walking distance to shops and restaurants but far enough away from the bustle of central Ubud. Tjampuhan is a very appealing hotel with old world charm located within easy walking distance of Ubud town centre and other attractions. It is set in lush surroundings with great views that help impart a relaxing feeling and a wish to stay longer. The buffet breakfast in the new restaurant is excellent. Staff from the management down are, without exception, welcoming, efficient, warm and friendly. We were sorry to leave and hope to return..
We travelled with a 10 year old who absolutely loved the place. Make sure you spend some time in the Spa. We have stayed at this hotel before and thoroughly enjoyed it, that's why we decided to stay here again. The property is just breathtaking in terms of it's position on the river and the harmony with nature. Would recommend it . We had heard bad reports about the steps, but this is what makes the place special. NO good for wheel chairs but good for everyone else. Every villa has a great view over the river valley, a really relaxing setting and just a short walk to the Ubud town center. Lovely place to stay. Very traditional. Kept very clean. UBUB fab place to stay. Not any good for unfit though as ALOT of stairs to get to and from anywhere from your room to the receiption, pool etc. Staff didnt speak very good english, but were helpful. Right on the river bank, with lush greenery and waterfalls. Lovely beauty. Spa service ok, have had alot better but cant beat the surronds. Not good for elderly due to the stairs. Happy we stayed here. Friendly staff and tranquil views. Great ! Loved the situation of Hotel Tjampuhan - up in the hills with the river down below and lush gardens. The staff were friendly yet unobtrusive and helpful when needed. Would definitely recommend this hotel. Stunning location but hard on the knees! Lovely, lovely hotel set on the side of a ravine...filled with monkey carvings, lotus ponds, and little gardens (easy to get lost in). Helpful and friendly staff, convenient to get into town... well appointed rooms with no TV (so a real escape). BUT people should be warned, do not book this if you have any mobility issues. The scenic quality of a hotel on a hillside = lots of stone steps between the lobby and the dining room, your room, the pool, etc etc. No lifts. No ramps. I would absolutely go back, but wouldn't take a friend with a wonky knee... (or small and adventurous children). I was in a group of 4 single friends for a week. We were very pleased with the hotel because it is set in lush beautiful tiered gardens with comfortable pleasing rooms - the airconditioning worked - and the service was faultless, with warm, friendly staff attending to all our requests and needs. It was a delight to be there and we were able to get into town in minutes, either walking or taking the free shuttle or getting a very cheap taxi. The only problem we could see was that anybody with weak or troubled knees or a disability would not be able to manage the tiered steps at all. This would be a serious concern for some. This is a concern for very young children too. Otherwise, this hotel can be strongly recommended. My group would happily return. Always enjoy staying at the Tjampuhan. 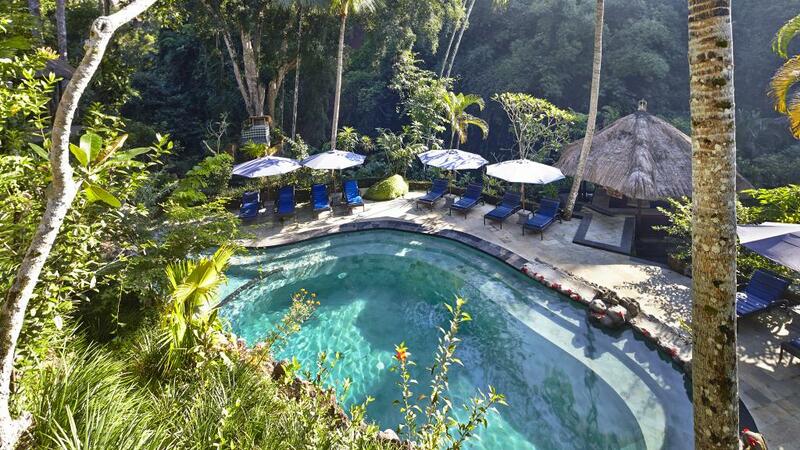 It is a fantastic setting and is within walking distance to the main town of Ubud.